Homebuilders’ association recommends energy renovation program to maximize environmental benefit. KELOWNA, B.C. 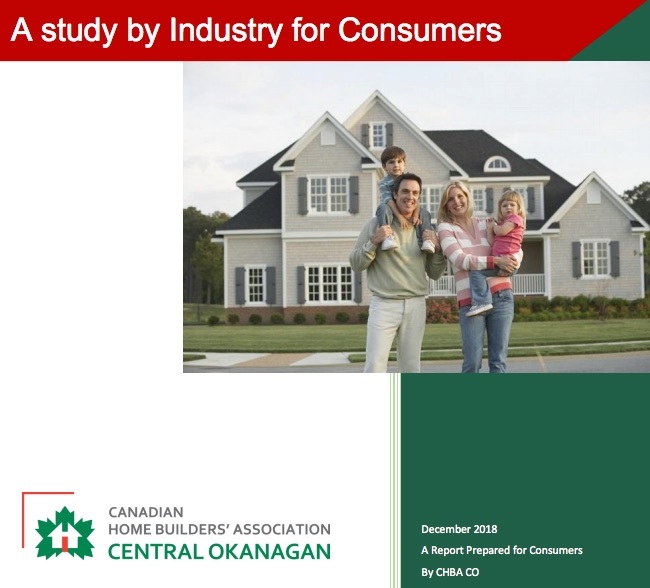 – Today, the Canadian Home Builders Association of the Central Okanagan (CBHA-CO) released its report “A Study by Industry for Consumers” on the cost of implementing the BC Energy Step Code (Step Code). Its data reveals a significant increase in cost to the homebuyer, up to five times the amounts estimated by the Step Code Council. While the Step Code has been presented as having “only very modest construction premium increases” to homebuyers, the CHBA-CO Study reveals that these costs will be nearly five times higher than anticipated. This will place more pressure on the affordability of houses in the area. Based on data from its report the CHBA-CO recommends keeping the Step Code voluntary and wants to work with all levels of Government to implement an energy efficiency renovation program. The CHBA-CO reports that every dollar invested in an existing home will yield four to seven times more greenhouse gas reductions than the same dollar invested in a new home. The BC Step Code is currently voluntary and the program is aimed at increasing the energy efficiency of new homes being built in the province. It goes above and beyond the base building code and provides a performance based approach towards building more energy efficient homes. The City of Kelowna is currently considering making the Step Code mandatory within its municipal limits. “The Step Code is a great way for Politicians to score green points with voters, however the program simply passes on its costs to homebuyers, resulting in the next generation of homebuyers being locked out of the market. Implementing the Step Code comes at a substantial cost. We cannot allow home ownership to become a privilege to only the wealthy.” says Les Bellamy, president, Canadian Home Builders Association, Central Okanagan. The CHBA of BC, recently commissioned its chapters, of which CHBA-CO is one, to design and cost out what it takes to build a new home up to the Step Code standards. Today’s report is part of that initiative. “We had industry professionals draft up building plans that meet Step Code requirements. They design projects every day and develop real building plans and cost estimates. The data in this report is shockingly different than the estimates presented by the Step Code Council,” says Bellamy. In addition to the increased cost and pressure on affordability, the CHBA-CO report raises concerns about the industry’s capacity to implement the Step Code and a concern for the actual environmental benefits. The Step Code applies to construction of new homes only, which represents only one percent of all homes in BC. Houses built before 1990, on average, use 100% more energy than new homes. Those built between 1990 and 2012 use 60% more energy than homes built to the current building code. “If the objective is reduced greenhouse gas emissions, it is better to focus on renovations to 99% of BC Homes. Energy retro-fits, completed by licensed contractors, will have massive environmental benefits and contribute far more to reducing greenhouse gas emissions and improving the environment” says Bellamy. Implementing the Step Code requires Certified Energy Auditors. It will take time to build the capacity of qualified advisors. All builders, designers, tradespeople and building inspectors need to be trained on Step Code standards. The additional costs required will be passed on to the home buyers creating pressures affordability and will create construction delays. Bellamy will present the findings of the report to the Energy Step Code Council on Dec. 12 in Vancouver.